Wilco's SCHMILCO is a mostly acoustic record, but that doesn't mean it's a tame one. It bears neither the vicious, fuzz-glam guitars of 2015's STAR WARS, nor the dazzling, baroque-ish arrangements that fans have come to expect. But in their place is a spaciousness and chaos that might feel welcome after twenty-some years of enjoyed but now-familiar Wilco releases. Schmilco is loose, and that's a good thing. 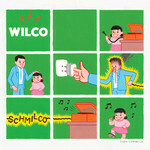 Schmilco is Grammy-award winning Wilco's tenth studio album and its follow up to last year's STAR WARS. The new album was recorded at the band's Chicago loft and is released on their own label , dBpm Records.